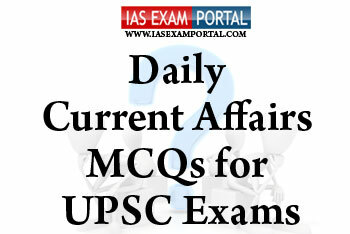 Current Affairs MCQ for UPSC Exams - 16 JANUARY 2019 | IAS EXAM PORTAL - India's Largest Community for UPSC Exam Aspirants. 1) CGF will have the objective of contributing to the national effort of improving the cleanliness of the river Ganga with the contributions received from the residents of the country, NRIs/ PIO and others. 2) CGF contribution by corporates comes within the purview of corporate social responsibility initiatives. 3) As of now ,biggest contributions towards the CGF has been done by NRI’s and domestic private entreprises. 1) It is an initiative to enable women entrepreneurs and women SHG’s to sell handicrafts and handloom, accessories, jute and coir products, home décor and office furnishings, directly to various Government ministries, departments and institutions. 2) The initiative aligns with Government’s initiatives for MSMEs, especially to reserve 3 percent in government procurement from women entrepreneurs. 3) Womaniya on GeM will spur hyper-local economic opportunities for women entrepreneurs and address goals and objectives under UNSDG of Achieving gender equality and empowerment of all women and girls. Q4. Which of the following statements with respect to desalination of salt water method are true ? 1) Currently, approximately 1% of the world's population is dependent on desalinated water to meet daily needs, but the UN expects that 14% of the world's population will encounter water scarcity by 2025. 2) Desalination plants causes harm to the environment by discharging the residual brine water containing chlorine & copper back to the sea and thereby increasing the salinity of water. 3) These chemical accumulation in sea water can have toxic effects on fishes, affecting their foods aswell. Shell fishes, crab & other creatures on the seabed are the most affected ones. Q5. The famous Lippa-Asra wildlife sanctuary where snow leopard was spotted recently is in which of the following Indian states ?